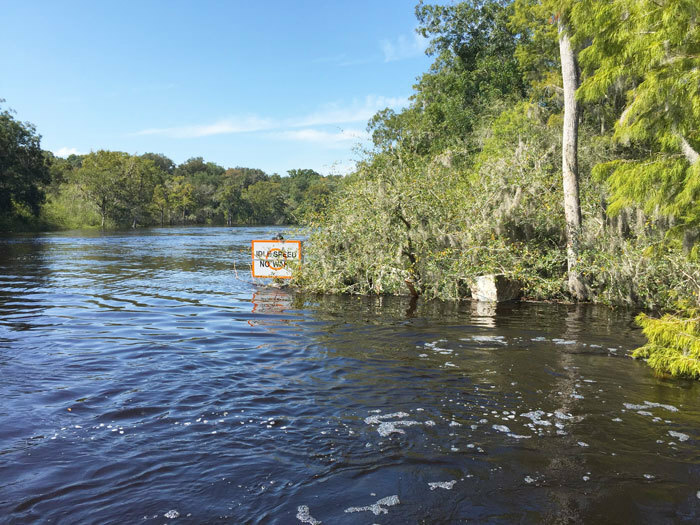 Two idle-speed, no-wake zones were activated today, with one on the Suwannee River and another on the Santa Fe, according to Florida Fish and Wildlife Conservation Commission (FWC) officials. Zone 1 was activated on the Suwannee and runs from the U.S. 90 Bridge at Ellaville south to the State Road 51 Bridge at Luraville. This 39-mile segment becomes an idle-speed, no-wake zone when the Suwannee River reaches 46.25 feet or more above mean sea level at the Ellaville gauge. Today, the gauge was at 47.28 feet. On the Santa Fe, Zone 8 was activated. This zone begins at an unnamed island approximately 4.25 miles upstream from the confluence of the Santa Fe and Ichetucknee rivers (coordinates: 29° 54.527’ N, 82° 46.074’ W) and ends at the confluence of the Suwannee and Santa Fe rivers. This includes the Ichetucknee River upstream to the U.S. 27 Bridge. This zone activates when the Three Rivers gauge reaches 16.25 feet. Today, the water level was at 17.78 feet. “With the recent rainfall, the river water levels have been steadily increasing,” said Capt. Clay Huff, area supervisor. “The higher water levels can create navigational hazards, such as floating debris, rocks, stumps and shoaling conditions for unsuspecting boaters,” Huff said. The two zones will remain activated until the water level recedes below their activation points. An idle-speed, no-wake zone means a vessel must proceed at a speed no greater than what is required to maintain steerageway and headway. At no time is any vessel required to proceed so slowly that the operator is unable to control it or anything it may be towing. Zone 5: This zone runs from the Santa Fe River at the River Rise in O’Leno State Park downstream to the center line of the U.S. 27 Bridge when the river is 34.2 feet or higher on the High Springs gauge. Zone 6: This zone starts at the centerline of the U.S. 27 Bridge downstream to .5 mile upstream from the State Road 47 Bridge when the river is 23.25 feet or higher on the Fort White gauge. Zone 7: This zone runs from .5 mile upstream from the State Road 47 Bridge, downstream to an unnamed island at 29° 54.527’ N, 82° 46.074’ W. and becomes an idle-speed, no-wake zone when the Three Rivers gauge reaches 18.75 feet. Zone 2: From the State Road 51 Bridge at Luraville to Little River Spring. This 18-mile segment becomes an idle-speed, no-wake zone when the Suwannee River reaches 25.25 feet or more at the Branford gauge. Zone 3: Runs from Little River Spring to the County Road 340 Bridge at Rock Bluff. This 23-mile segment becomes an idle-speed, no-wake zone when the Suwannee River reaches 23.25 feet at the Branford gauge. Zone 4: From the centerline of the County Road 340 Bridge at Rock Bluff to approximately 300 feet southwest of New Clay Landing Boat Ramp, from approximately 6,000 feet north of Camp Azalea Boat Ramp to approximately 1,300 feet south of Yellow Jacket Landing, and from approximately 2,000 feet northeast of Fowler’s Bluff Boat Ramp to approximately 1 mile southwest of Fowler’s Bluff Boat Ramp when the river level is 8.35 feet or higher on the Wilcox gauge. For more information about the flood zones, call 386-758-0525. To report violations, call 888-404-3922. To obtain real-time river level information, visit MySuwanneeRiver.com.